A healthy residential or commercial landscape requires routine maintenance & care all year long. With proper attention, you can keep your lawn looking colorful and vibrant through every season. It is important to work with seasoned professionals when it comes to lawn care. ‘Tis The Season – Everyone has their favorite plants that they wish would grow all year long. While that is true for some species, most plants pop out during peak seasons. Knowing your plants and in which season they grow best can insure that you have a thriving garden with a mixture of greenery year round. Have a Dirty Mind – In order for you to maximize your landscape’s beauty, it is important to know the ground and what’s in it. Our Avila Beach Lawn Maintenance can give you comprehensive soil evaluations and tell you what you need in order for your soil to be the right home for your plant life. You may need to fertilize your lawn, important fresh soil, or rotate different plants in order to keep from wearing it out. Mulching – Laying down mulch in your flower beds or landscapes gives your garden a clean, natural look. It also showcases your featured plants. Mulch may cut down on weed growth, but more importantly it helps the soil to retain moisture. This is especially helpful during periods of the year when rainfall is low. It is important to lay down the right type of mulch for your garden and plants. Irrigation – Irrigation systems reduce the amount of time you have to spend in the yard. New irrigation models are more durable and efficient than the older systems. Make sure your irrigation is spread out across your yard so that the water is evenly distributed. Two popular types of lawn irrigation are sprinkler and drip systems. Contact Dan’s Landscaping Company to find out the benefits of each. Keep It Clean – Other than the obvious curb appeal that you want your lawn to retain, it is important to keep your lawn clean all year long. Even the most ornate landscapes lose their appeal when they are surrounded by messy growth. Weeds, shrubbery, and foliage also steal sunlight, nutrients, and water from your gardens as well. Keeping your lawn free from all of these insures that your plants will thrive. Is Your Yard Sick? – There are a number of reasons why your grass or plants won’t grow. Two main reasons are diseases that spread throughout the landscape or certain types of plant eating insects that invade your yard. It’s important to have your yard sprayed from time to time to keep it growing healthy. 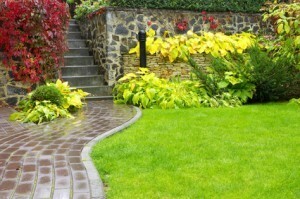 Make sure you hire a contractor that uses eco-friendly chemicals on your yard. Landscaper Versus Gardener – What Is The Difference? If you are looking for a professional Avila Beach Lawn Maintenance Service then contact Dan’s Landscaping Company at 805-550-5488 or complete our online request form.